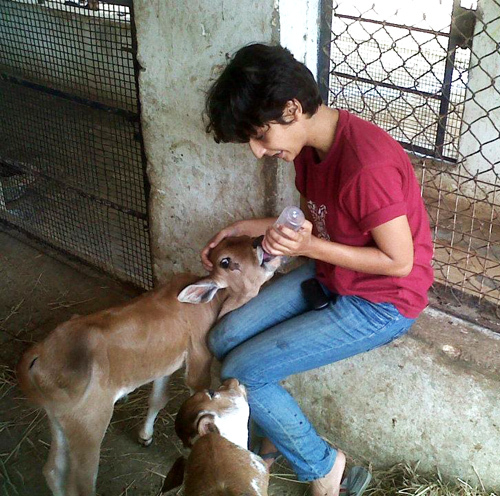 Nandita Saha playing godmother to two rescued little calves, Krishna and Aloft, at Blue Cross of India. Blue Cross rescues a great many cows, as well as all kinds of other animals. Earlier this year, they rescued over 100 bulls from illegal transport. To visit Blue Cross of India’s facebook page, click here. To visit Blue Cross of India’s website, click here. 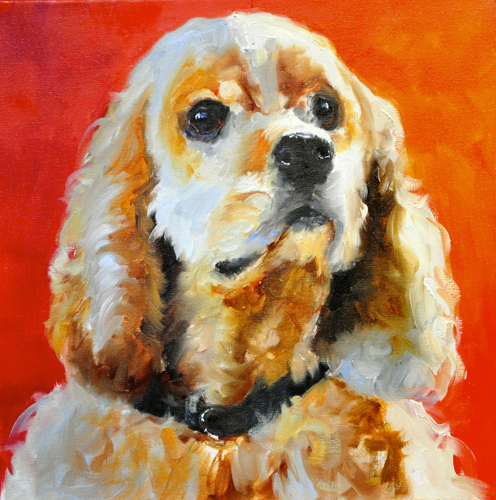 Linda St. Claire’s exquisite brush strokes reveal the soul of the animal. 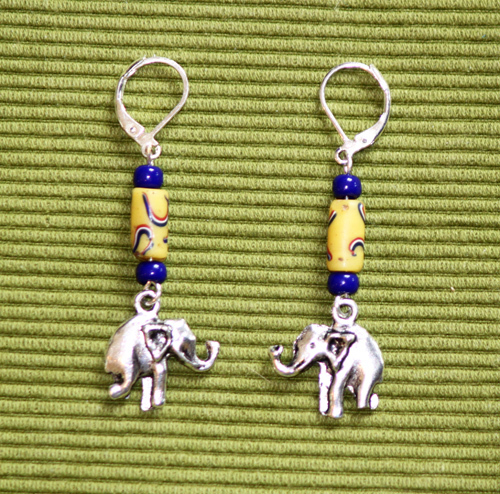 Known throughout the U.S. and worldwide, she is among the artists who are generously donating their artwork to the Kindred Spirits Animal Sanctuary Benefit Art Show, to be held August 11, 2012. 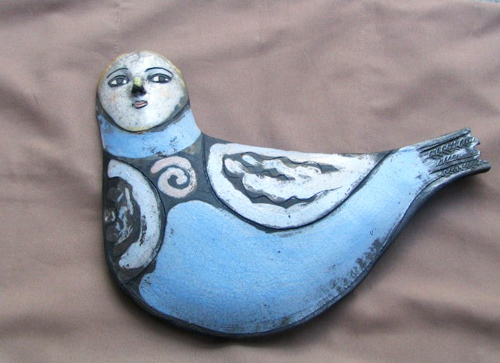 This ethereal, angelic dove was created by Barbara Harnack, whose artwork has an otherworldly touch, especially the faces. Raku is a special technique of firing ceramics, originally discovered in the sixteenth century by a Korean potter. “Oheke” means “bashful” in the Hawaiian language; Alexis Higginbotham learned the meaning from her Hawaiian mother. 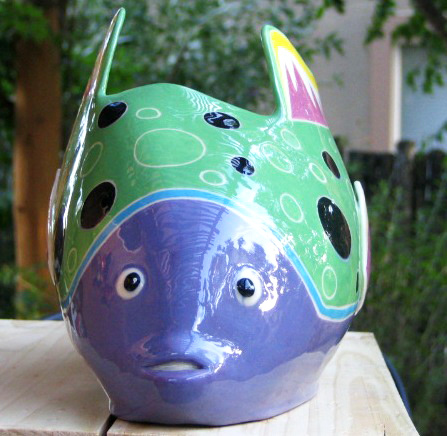 This lovely fish exemplifies the sensitivity of her artwork. To view these and many more enchanting works of art – and to meet the charming residents of Kindred Spirits, a very gentle and light-filled sanctuary that provides elder and hospice care for dogs, horses, and poultry – please attend their Benefit Art Show on August 11. Radio host Disha Oberoi, on Live104.8FM, will be holding a fundraiser on air from 7 to 8 pm this Friday evening, July 13, 2012, for Blue Cross of India. If you’re in or near Chennai, be sure to tune in. You can make a pledge of funds, and even specify how you’d like it spent – for food for the animals, vet care, ambulance services, or whichever way you’d like your donation to benefit the animals. There will be lots of music and success stories about animals rescued, so it will be a fun event. This is follows the recent highly successful adopt-a-thon, in which over 60 Blue Cross animals found their forever homes. 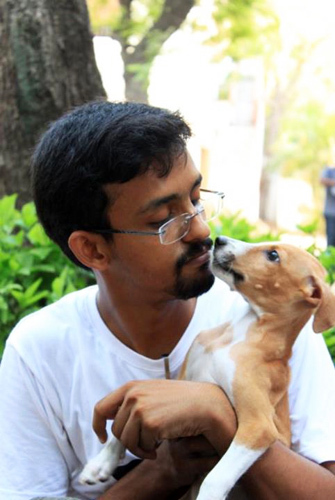 It’s the first hour-long on-air fundraiser for animals held by a Chennai radio station! That’s 7-8 pm this Friday on Live 104.8 FM. On a beautiful sanctuary of grassy islands and palm trees, Save the Chimps, in Fort Pierce, Florida, cares for nearly 300 rescued chimps who once lived in solitary confinement in laboratory cages, as research chimps. Now they live happily in families, enjoying their lives with plenty of room to run and play in the open air. To find out more about the work of Save the Chimps, click here. 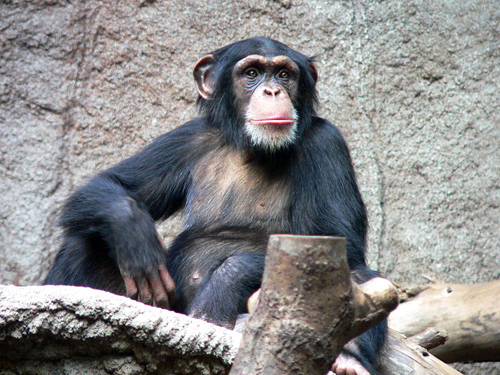 Photo: Thomas Lersch / Wikimedia Commons / Creative Commons Attribution-Share Alike 3.0 Unported / This is another chimp, not one at Save the Chimps. During recent rains, five egret siblings were found on the street near a fallen tree and brought to PAWS. They are old enough to catch food for themselves, and PAWS released them on Khidkali Pond, where there are other egrets. To visit PAWS Facebook page, click here. 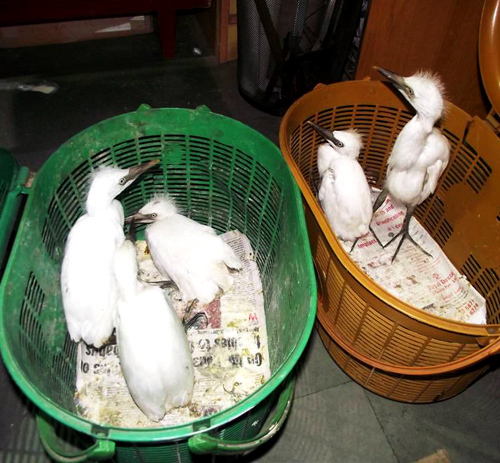 On July 3, 2012, heavy rain fell in Mumbai for the second day, resulting in many distressed birds being received at PAWS center. Some of the birds who were uninjured were released in suitable habitat. This kite and several pigeons were sent to Thane SPCA, also in Mumbai, for rehabilitation and eventual release. 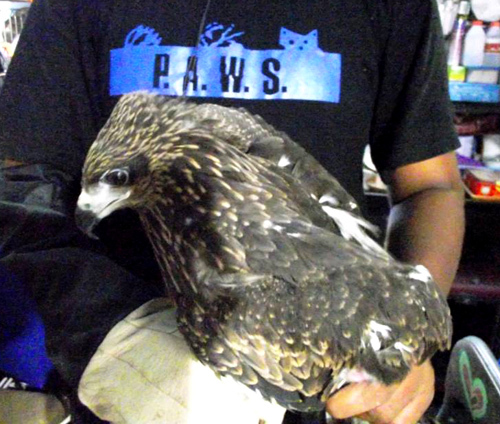 PAWS rescues many wild birds, snakes and other wildlife, as well as dogs, cats, and other domestic animals.